When you first get this game up and running, it looks like a typical Novomatic slot machine. The sounds are all familiar and it has 20 pay-lines. That said, it does have nice graphics and a lot about it that makes you think about the fair. If you remember what it was like to be a wide eyed kid, getting ready to take the first Roller Coaster ride of the season, you will love Roller Coaster by Novomatic, a 5 reel and 20 paylines video slot with a nostalgic, retro vibe reel background. The main symbols are everybody’s favourite things about the fairs: the Ferris Wheel, Carousel, Bumper Cars and the follow up accessories - Bag of Popcorn, Lollipop, Ice Cream. pretty much all the stuff that makes a perfect afternoon. 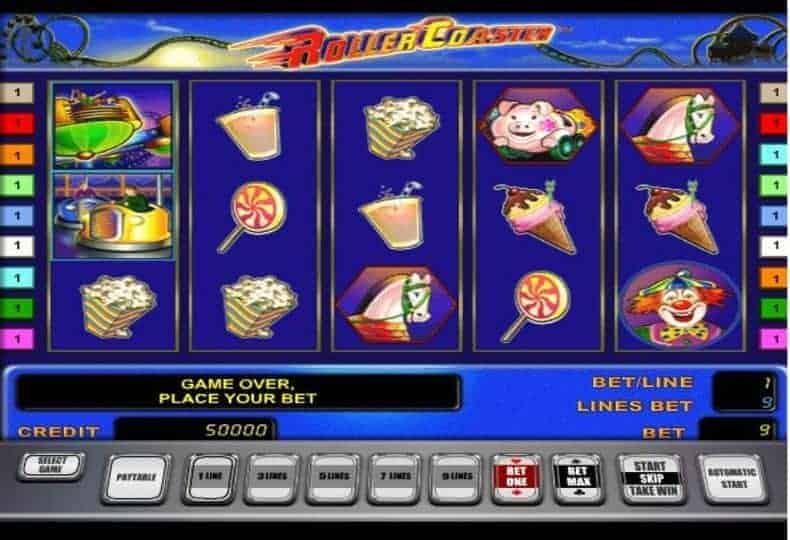 The Wild of the slot is naturally the Roller Coaster icon that lands on reels 1 and 5, subbing for all other slot icons and increasing your chances of hitting a winning combo. The combination of Roller Coaster and the Ferris Wheel icons will unlock the slot’s special feature, The Ferris Wheel bonus round. Depending on the number of symbols within a combination, the player can win either win 2 or 5 free games and re-trigger the bonus feature if a new Roller Coaster icon lands on the reels. Maximum spin payout that you can expect from this slot is 5,000 credits, generated if the highest value icon, Hurricane Ride, forms a combination of 5, left to right. New Zealanders and Australians can also give the Roller Coaster pokie a go and play it in their local currency, through online casinos that accept players from these locations. If you reside in the UK and enjoy playing Fruit Machines, you will also get to “test ride” Roller Coaster and play for free or switch to real play mode as soon as you are ready to cash in your time. As you expect, there are roller coaster symbols and also a big wheel one. If you get those together, you get the bonus. Like a lot of Novomatic games, the bonus is a free spin round. This one is different, because you get a Ferris Wheel feature in it. So, you don't get the huge numbers of free spins you would normally expect, but you do get a huge chance of winning big because of that Ferris Wheel feature.